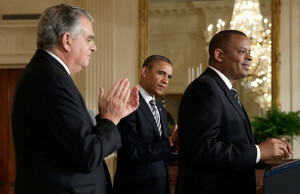 Democratic President Barack Obama proposed nearly $500 billion for transportation today, and Transportation Secretary Anthony Foxx will follow that up tonight with the launch of a national conversation on what the U.S. highway and automobile will look like over the next 30 years. Obama is proposing spending $478 billion on roads and rails over the budget’s six-year life. He’d pay for it by “pro-growth business tax reform” requiring companies to pay tax on the $2 trillion they have abroad. According to USA Today, this means Obama would tax overseas profits by 14 percent once. The budget isn’t going to pass an opposition Congress as is, but transportation spending could be less contentious than other items during the negotiating process. States appear to be seriously grappling with their infrastructures this legislative season, and even red states might welcome a little money from the feds on this one. For drivers, poor roads are awful. For collision repairers, there’s a certain benefit in all the potholes and rear-ending-proving gridlock. What states and the federal governments do to address these affect your business as well as your tax bill. Support for self-driving cars and federal wishes for fuel economy and safety systems could also impact your business. Fleet fuel standards helped lead to materials like aluminum in vehicles to shave off weight. Safety systems and self-driving cars have the potential to cut into repairers’ business, though as we learned with Edmunds’ F-150 taillight crack, sensors required can jack up the price of a repair. Continue to check Repairer Driven News this week for more on what develops from the chat. You can also follow the chat tonight and join the conversation on Twitter with #beyondtraffic.